Slopeside are ski in ski out condos for sale in Keystone CO Real Estate. Built in 1986 there are a total of 67 Slopeside condos in Keystone CO. There are 60 – studios, 6 – one bedrooms and 1 – two bedroom condo ranging in size from 259 – 854 square feet. 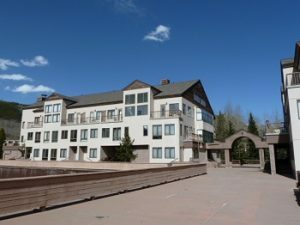 Slopeside is located at Mountain House, steps from the Keystone Ski Resort, between River Run and Keystone Lakeside Village. When you own a Slopeside condo you can also enjoy the tranquil Snake River which flows behind the property near the Summit County bike path. Slopeside condos are also on the Keystone bus route for easy accessability to other areas in Keystone Colorado. After a wonderful day on the slopes, on your bike or fly fishing in the Snake River you can relax is one of the two outdoor hot tubs that feature amazing ski area views. Slopeside also has garage parking and common area laundry in each building. If you have been looking for an affordable ski in ski out condo for sale in Keystone CO Real Estate you must see Slopeside. Being so close to a variety of outdoor activities makes Slopeside an ideal Keystone condo.